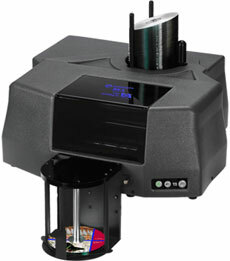 A Desktop Solution for Producing Low to Mid-Volume Runs of Discs... Automated Duplication and Printing In House! Enjoy the benefits of industrial disc printing combined with duplication with the entry-level price tag of the Microboards DX series! Single or dual high-speed DVD/CD drives and robust automated duplication software make designing labels, printing, and burning discs a snap. Don't let the small size and ease of use fool you. The DX Disc Publishers are all in one production packages, controlled from your PC over a single USB 2.0 cable using the included software suite. The DX Series publishers are supported on Windows XP only -- Vista & Windows 7 are not supported. - SureThing 4 must be used with the DX Series publishers. SureThing 5 is not compatible.